Steel plate adopts the world first-class computer control of pressure resistance welding machine manufacturing, the warp and weft) (according to certain spacing arrangement of twisting into the side of flat steel, square steel pressure welding point solid, surface is obtained for the rectangular hole grating plate. Flat load bearing, rail (twisting fang) ACTS as connection, on behalf of the direction of the length of the steel plate, flat steel direction bar direction on behalf of the steel plate width. On the surface of the steel plate according to the bearing flat steel shape, can be divided into planar, tooth shape and type I. 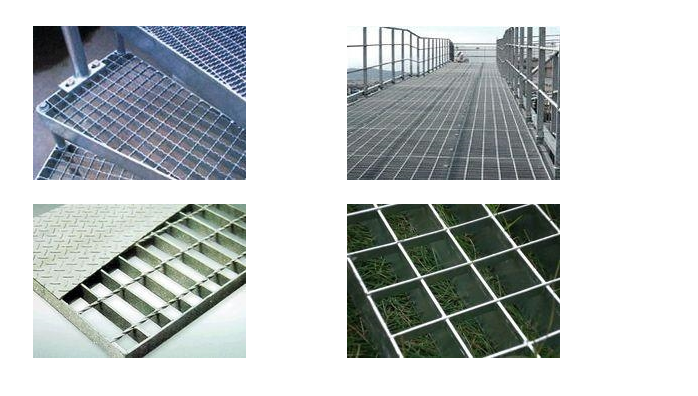 According to specification, the spacing and lay flat steel square steel arrangement spacing is different, can be combined into more than 200 specifications varieties, according to the use of different environment, can be different on the surface of protective treatment. Passages, ventilation fence, mooring dock and pier, frame and frame, pedestrian overpass, drilling platform, transmission corridor bridge, bridge footpath, trench cover, ventilation window, railway across the aisle, manhole and lighting, anti-theft doors and Windows, airport fence, trash rack, wall fence, paint room, storage shelves, sidewalks, billboards, livestock equipment, equipment safety fence, pipe rack column pier, scaffolding, Marine landing pedals, washing, vans, grating, shading box at the top of the aisle, platform, ladder pedals, Marine workboat, feeder walkway. Modern style: beautiful shape, design specification, ventilation pervious to light, give a person with overall sleek modern feel.